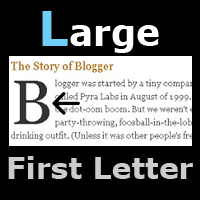 Large first letter in your blogger post is a very cool tool for your blog. And you can easily drop can your first letter in blogger post where you want, first capital letter in your post. So you can use this code for adding this this effect to your blog. So lets go and see how to large your first post later. 5: just use this code when you write your post and add your text in this code. 6: you successfully complete now Publish your Post and don this work.